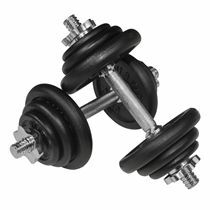 The York 15kg Cast Iron dumbbell set is designed to provide challenging, comfortable and safe workouts. The set is comprised of 8 x 1.25kg weights, 4 x 0.5kg weights, and 2 spinlock dumbbell bars with 4 grey vinyl spinlock collars which together weigh 3kg. This lets you to adjust the weight you wish to lift, up to a maximum of two 7.5kg dumbbells. The bars have knurled black Nylon hand sleeves that are crafted to deliver an optimum fit and heavy-duty threaded ends for the 4 spinlock collars. The discs of the dumbbells have been provided with a radius edge that ensures an easy lift and a durable matt black finish. They feature an embossed York logo and the weight mark in kilograms. for submitting product information about York 15kg Cast Iron Dumbbell Set We aim to answer all questions within 2-3 days. 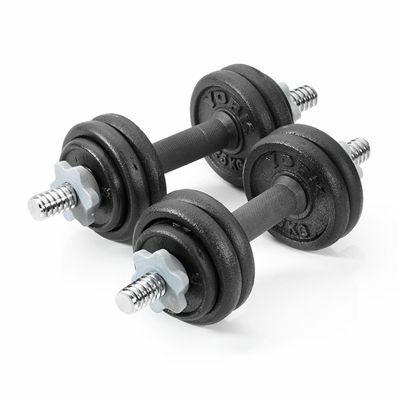 for submitting product information about York 15kg Cast Iron Dumbbell Set. We aim to answer all questions within 2-3 days. If you provided your name and email address, we will email you as soon as the answer is published. What are the weights of each disc? The 15kg Cast Iron DB Set consists of 8 x 1.25kg weights, 4 x 0.5kg weights, plus 2 x spinlock dumbbell bars with 4 x grey vinyl spinlock collars (these make up the other 3 kg). Are these dumbbells adjustable or only set at 7.5kg? The York 15kg Cast Iron Dumbbell Set is devised of individual weights, therefore, allowing you to select a combination of weights as per your requirements. Is this price for 2 x 15kg set? This set comprises of 2 x 7.5kg dumbbells. Very good quality, good grip, safe locks. for submitting product review about York 15kg Cast Iron Dumbbell Set.